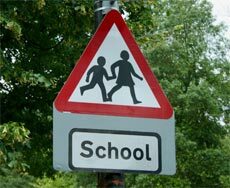 Plenty of people complain about school run mums and their selfish attitudes but I'd like to gripe about a particular type of school run mum, the ones that drop their kids of at private schools. On my 19 mile drive to work I pass 6 different schools so I leave 15-20 minutes earlier than I would need to at any other time of the day to account for getting stuck behind the school buses. Notwithstanding this I always hit the junction where there is a large private school at around 08:45 am. Prime dropping off time. The turning into the school is roughly in the middle of a 500 yard straight section of road, but this doesn't stop the mums that have dropped their little angels off from pulling right out in front of you as if they never saw you. They don't even have the decency to pretend that they never saw you, they see you coming, wait till your close enough that they can look you in the eye and then just pull out! I think they assume they have right of way because they drive a big 4x4 or a BMW and can afford to send their children to private school. They're such ignorant people! I wouldn't mind so much if they pulled out and sped off with their big engines, but no, they cause you brake hard enough to bang your head on the steering wheel and then your stuck behind them puttering along at 35-40 mph because they don't have a job to get to. Its not just one mum either, its all of them and it only happens at that school, not the other half dozen schools that I pass on my way to work. All my neighbours that use that route to work also complain about them, but we are at a loss as to what can be done about them! That proves you were right. Obviously people who weren't privately educated could never do well in business. If you were not well off why did you send your children to a private school? Complete waste of money! We all get carried away sometimes DSG, but you took the criticism on the chin, so good for you. I get carried away too at times and I don't have the excuse of being a kid. DSG - I don't mean to be hard on you and I meant to say that I liked your posts about cycling, especially the stationary objects. "Do they seriously think I'm going to allow a bit more space in front of me in case the small person suddenly .....flings itself under my wheels? Come on kid, you are giving the impression that you are driving rather than that mummy was dropping you off at the expensive private school. You know I got to 48 before I became grouchy; you are much too young to be so critical of other people and so pessimistic in your outlook. I know that Chris. It's just when I get dropped off at school,I take notice of those signs,OK? DSG said "What do people expect me to do when I read the "Baby on board" or "Small person on board" sticker in the back window of their car?" As you have frequently told everyone that you are 14 , what I would expect is that you would not be driving. What do people expect me to do when I read the "Baby on board" or "Small person on board" sticker in the back window of their car? Do they seriously think I'm going to allow a bit more space in front of me in case the small person suddenly chews through its harness, throws open the car door and flings itself under my wheels? Or perhaps they're trying to warn me that their own driving may be a bit erratic, as they are constantly having to turn round and coo at the little darling or sing little nursery songs to keep it amused, or pick its little rusk out of the ashtray? No, I don't think so. What they're doing is bragging. They're so proud that they've actually managed to do what millions of other couples (and many thousands of single people too) have done since the dawn of time, what animals do with monotonous regularity and without conscious thought. As someone whose kids go to a private school and who does the school run daily, I have to agree. Arrogance isnt the word for most of them. If you bang your head on the steering wheel because you've had to brake hard, then you are either lying, or not wearing your seat belt ! I agree with Biker Hater, methinks the author or authoress of this article has a ruddy great tree on their shoulder !! LouiseR : I drive a Micra !! I will not have her insulted !! I live in the country, am very horsey and doggie, and certainly am not averse to getting my car muddy. In fact, as I type, she is sitting out on my drive covered in mud because she has not been washed for about 6 months. I don't see the point washing cars, I really don't. All the horse **** and mud protects the paintwork from bird **** and salt on the roads. How can you say no-one aspires to have a Micra - I do !! They are fab cars (the new shape, not the old I have to say). She turns on a sixpence, does 48 to the gallon, I can squeeze her in anywhere, the insurance is dirt cheap, she has an intelligent key so even if anyone broke into the car, they couldn't start her up and drive her away. I am a HUGE Micra fan, and accuse YOU Louise of being Micra-ist !! The author of this gripe obviously has a chip on their shoulder. you should attend your local state school and walk. then all schools would be much the same and not " good " and "bad " schools. I don't have children. I don't want them. However, I can't afford one car to tow with and one to drive normally!! And I live in a village, so it would be a bit difficult to avoid driving in it. How, exactly, does driving my 4x4 in Sainsburys cause people a problem? I have better visibility and, as it is short wheelbase, a better turning circle than most family saloons. I think you may have an exaggerated impression of the width too. There are incompetent drivers in all cars, I can really see no reason why people pick on 4x4s, other than that they are conspicuous. In my experience of driving on narrow roads, I would MUCH rather meet a 4x4 driver, who generally has the sense and ability to pull up the bank if they need to than anyone else. "I drive a 4x4 because I have horses and use it to tow a trailer, and it also goes off road"
That's fine, I don't think any reasonable person would object to that. Here are a couple of possibly hypothetical questions. Do you use it to go to Sainsburys or to drive on the narrow streets in your local village? Do you use it to drop your children in the street outside their schools? If you do, then you are the type of person that generates complaints that you are reading about.